Whilst ranting/discussing on hogmanay about why a Yes vote isn't obviously a bad economic choice and quite possibly a good economic choice, I had the flow of my argument disrupted somewhat. It wasn't just the drink: my problem was that I was actually making two separate arguments, and the logic of one does not translate to the other. Obviously saying Germany's great and that the UK does badly and that this is because small countries function better is nonsensical. But I think the two points both stand - it's just that they stand independently (so to speak) of each other. Consider those countries of Northern Europe which have never been part of the communist block, as the set of suitable comparators: Iceland, Norway, Sweden, Finland, Ireland, UK, Denmark, France, Belgium, Netherlands, Luxembourg, Germany, Switzerland and Austria. All data is 2010 GDP per capita at Purchasing Power Standard from Eurostat. 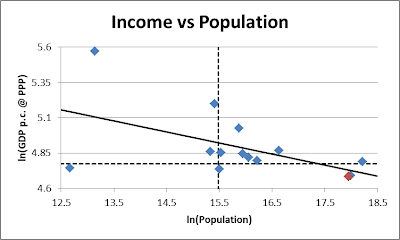 The trend (solid line) for income per capita against population size is decreasing, hence the first argument. 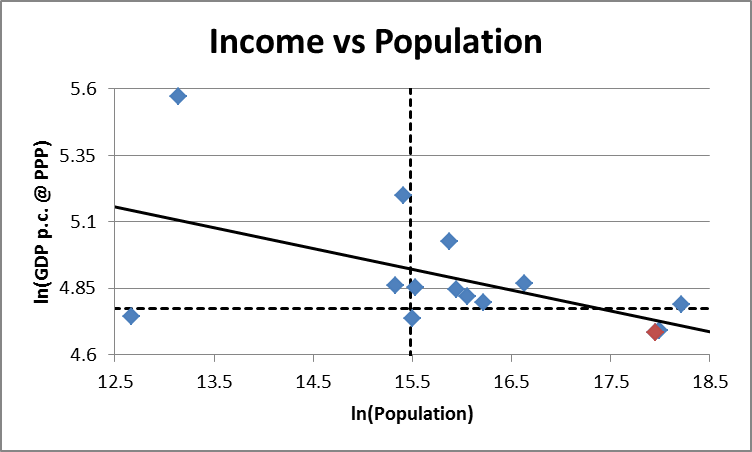 The vertical dashed line shows Scotland's population and the horizontal dashed line shows average income per capita across these countries. The red data point is the UK - slightly below the average for this group of countries, but not by much. This is not a very strong argument for independence: it is suggestive of small countries doing slightly better than large countries, but tells us nothing about the direction of causality. Small wealthy regions may choose independence rather than independence leading to wealth. It remains the case though that we have circumstantial evidence in favour of the first argument: the small countries of North West Europe appear to do a bit better than their larger neighbours, and this bodes well for the prospects of an independent Scotland. The second argument is that the UK's regional policy is particularly poor and that the UK is a particularly bad place to choose to be a peripheral region. We have seen that per capita income in the UK is slightly below, but very close to, the average for this group of northern European countries - but how is this income distributed within the country? I rank the NUTS-2 Regions within this group of countries from lowest to highest. 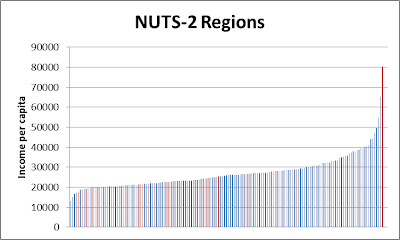 If the distribution within the UK was similar to that within the other countries of this group then we should see the regions of the UK (red columns) clustered around the middle of this ranking. We see that rather than clustering around the middle, the red bars are disproportionately in the bottom half of the distribution, with very few in the upper half. But the UK is not a poor country: it's an average country within this group, so why are almost all its regions in the lower half of the income distribution? 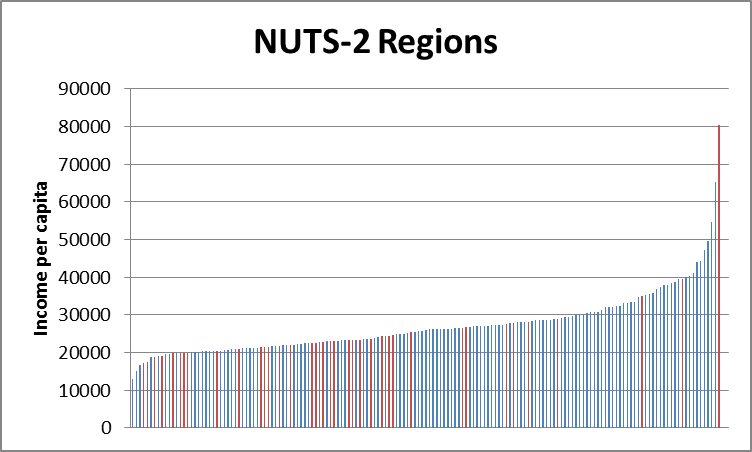 The answer is that it has the most skewed regional distribution and London is the richest NUTS-2 region in Europe. 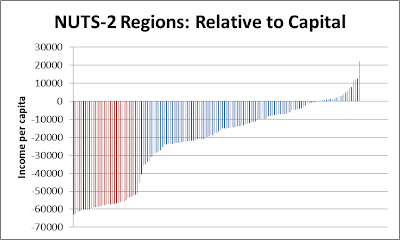 The following chart shows the same data as the previous but as deviation in income per capita from the NUTS-2 region with the national capital. The regions of the UK occupy ALL of the bottom spots. 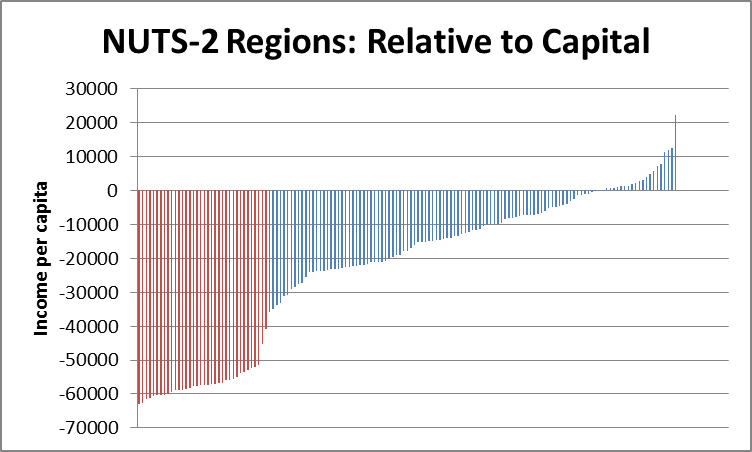 So I think there is strong evidence in favour of argument 2: regional policy in the UK is terrible and if you are not the capital then independence is not a bad idea. Again this evidence is not overwhelming: it could be the case that the UK is fundamentally a very poor place compared with everywhere around it, and the wealth of London is pulling us all up. I don't believe that this is the case though. I think it is likely that policy is such that human and physical capital investment which in other countries is spread around, in the UK is instead directed towards London, and almost every single region of the UK is losing out as a result.